Artist's concept of the dwarf planet Haumea and its two satellites (Hi’iaka and Namaka). Haumea is a dwarf planet that orbits the sun far beyond Neptune. It is about the same size as Pluto and has two moons. One of its notable characteristics is how fast it spins on its axis. Just after Christmas of 2004, a team from the Palomar Observatory, led by Mike Brown, discovered a tiny, Pluto-size body in images taken the previous spring. The astronomers nicknamed the rock "Santa." About the same time that Brown's team published their information online, a group of astronomers from the Sierra Nevada Observatory, led by José Luis Ortiz Moreno, announced their discovery of the body in images taken in March of 2003. The object was renamed after the Hawaiian goddess of childbirth and fertility. Its two moons were named for daughters of the goddess, Hi'iaka and Namaka, who were said to have been born from the body of Haumea. Haumea takes 285 Earth-years to orbit the sun. At its closest, it only comes within 34 times the Earth-sun distance, while at its farthest, it lies more than 51 times as far away. These distances, combined with Haumea's tiny size, would generally make it difficult for scientists to accurately determine its mass and density. However, in 2005, the first of two moons was found orbiting the body, enabling scientists to determine the mass of the bodies. Haumea spins on its axis once every four hours, the fastest spin of any known large object in the solar system. Haumea's rapid spin keeps it from attaining a spheroid shape, instead causing it to look more like a slightly flattened football spinning end over end, as though it had been kicked. Haumea is 1,430 miles (2,300 kilometers) across at its longest axis, but less than half as wide — 619 miles (996 km) — at its shortest. Updated estimates of its mass and shape in 2017 showed that Haumea's density is likely similar to Pluto and that its shape may be too elongated to let it qualify as a dwarf planet after all. The rapid spin allowed scientists to calculate its density, because different materials would stretch out differently. As a result, scientists think that Haumea is made up almost entirely of rock. Observations of Haumea, however, reveal a brightly gleaming surface. Scientists have concluded that, though most of Haumea's interior is rocky, it is covered by a thin icy shell. Haumea also appears to have a dark red spot on its surface that may contain more minerals and organic compounds than the ice around it. In 2017, astronomers also discovered a ring systemaround Haumea, which was discovered when it passed in front of the star URAT1 533-182543 on Jan. 21, 2017. The starlight also helped astronomers more accurately measure Haumea's longest axis, finding it to be roughly 17 percent larger than previous estimates. The two moons of Haumea were discovered after observations at the W.M. Keck Observatory in Hawaii in 2005. They are far smaller than Haumea. The largest, Hi'iaka, is only about 1 percent as massive as Haumea, while the smaller, fainter Namaka weighs only about a tenth as much. Hi'iaka takes 49 days to travel around Haumea in a nearly circular orbit. The inner satellite, Namaka, takes 18 days to travel around its parent body in an elliptical orbit. Both moons are thought to be composed of almost pure water-ice, which may have originally come from Haumea itself. Although roughly a tenth of all known Kuiper Belt objects have a satellite, very few of them have multiples, making Haumea somewhat unusual. Astronomers think that, in the early solar system, Haumea was much like Pluto, composed half of rock and half of water. Billions of years ago, a large object may have collided with the body, knocking most of the surface ice away and imparting a rapid spin to Haumea. The spin, in turn, elongated Haumea into its unusual shape. The moons of Haumea may have once been part of its surface, forming much like Earth's moon did after a collision. The discovery of small, icy debris in orbits similar to Haumea's seemed to further substantiate the idea of an ancient collision. Haumea's status as an object in the Kuiper Belt puts it at the frontiers of science. Small objects such as Haumea have only been studied extensively since the early 2000s, as search techniques improved to look for dwarf planets and Kuiper Belt Objects. Science also took a leap forward in 2015, when the New Horizons probe flew by Pluto and got a close-up look of the dwarf planet. That flyby showed that many of our assumptions about dwarf planets need some examining. For example, Pluto's terrain showed mountains and extensive evidence of liquid flow in its ancient past, meaning that Pluto had active geology — a surprise to astronomers. New Horizons will fly by the KBO 2014 MU69 on Jan. 1, 2019, providing more information about these distant objects. Meanwhile, astronomers continue studying other dwarf planets and KBOs for more information about their formation histories. A NASA web page about dwarf planets has several general insights about these bodies, based on years of research. For example, most dwarf planets are smaller than our moon and, except for Haumea, no dwarf planet is known to have rings. Days on dwarf planets vary, as do the number of moons. For example, Ceres, the largest dwarf planet, has none. A moon was discovered around Makemake in 2016. 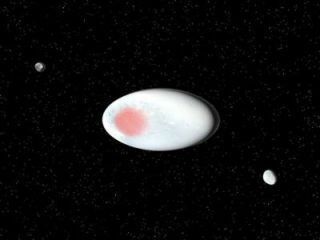 "Snow White" — the temporary name for the large dwarf planet 2007 OR10 — also has a moon, astronomers announced in 2016.